Hello, my name is Laura, I live in a small town in the south of France. I am 22 years old and I did a European Voluntary Service for 8 months in Malaysia with the NGO SOLS 24/7. I gave free English lessons for a poor and underserved community. My sending organization was Citizen Initiative and Development. I went to Malaysia to work with children for an underserved community; that was my first objective. Then it was for me the opportunity to improve my English, to discover another culture, to meet people, another language and face challenges. Because living outside of our comfort zone, without family, it is a real challenge. I chose this project thanks to the Local Mission, where I was registered to have my nursery placements. Every month I had appointments with my advisor, Mrs Baily Melanie. During one of my appointments I told him that I wanted to do a humanitarian service at least once in my life. She spoke to one of her colleagues, Ms. Ratajczak Sylvie, in charge of international mobility, and she propose me to do this service. It took me less than 5 minutes to accept, I thought I might not have this opportunity a second time. I almost stopped this project, my father died 2 months before I left, but I thought that if I stopped every problem, whether small or big, we will never move in our life. I followed what my father said “Do what you want, follow your dreams! At the very beginning, I was a little anxious; being alone in a new culture, a new continent, without friends, family or “support”. Speak in another language that is not my mother tongue. I had no expectations before going to Malaysia and do my EVS. I went there, eyes closed, and I wanted to see what was going to happen. I just wanted to be accepted and do my best, be involved as best I could and give something to the community I was working for. To be honest also, when I did some research on the NGO SOLS 24/7, I was expecting something more “typical” then to work for an underserved community. I worked for 5 months in Putrajaya, Malaysian administrative capital. But the experience was really interesting. I also spent 3 months in Kuantan, a less wealthy and more conservative city on the Muslim religion. But Malaysia is a country with mixed communities; Indian, Chinese and Malay live together, this gives an interesting and extraordinary melting pot. When I arrived there, my plan were first of all to improve my English, work with children and discover the Malaysian life style. After becoming closer to my community, I began to see and understand what were the “problems”, or what I could “change”, or just to give my “European point of view.” For example, I did a “Recycling Championship” for 2 weeks with the children, in order to teach them how and why it is important to recycle; Because often when I went to go hiking, whether it was in the jungle, public parks or beaches, you can see detritus everywhere www.svice.co.uk www.lesjardiniersdelamobilite.fr. It was a shame, they do not see the importance of preserving the environment. With adults we have debated, so that they improve to speak to an audience, and with the teenagers we have done many workshops for their future; Professional and personal (about the language of the body, we made the stories of the week to allow them to be more creative, talk about new technologies…) In terms of personal accomplishment, I learned that I could easily adapt to another culture, to another continent, outside of my “comfort zone”. That was the biggest challenge for me. Now I can say that I am more confident, I believe more in my skills and in myself. Before changing my center I had a farewell evening and almost all of my students came and told me how important I was and how I “changed” something in their life; For me it was one of my best memories. (Because I do not tell you all what I had between drawings, words, cups, jewels …), a wonderful compliment that one can do! It’s important to know what people think of ourselves, to have opinions. Because without that, we do not know what we can change, or improve. I also learned to keep it simple, because I think that in developed countries too often we concentrate on small things, which in the end are not so important. In terms of professional accomplishments, I learned to speak English (because in France one learns English, grammatical rules, but one does not practice it enough!). I also gave lessons in English (children, teens and adults) that spoke another language, the Bahasa Melayu. I took care of the administrative part of a center. Send reports or requests on time, sometimes with a short delay. How to face the challenges that the community can give us; Students or anyone who is late, or who do not come at all, shift appointments 10 minutes before … How to recruit, contact a local NGO. I also organized, at least once a month, an event for and with the community. If I had to share with you one of my best memories, it would be at my farewell party, before leaving Putrajaya after 5 months, and going to Kuantan for 3 months. Almost all of my students have come (as have the new ones that started two weeks ago with us). We started the evening at 8 pm and from that moment I spent my time only with my students, calling from group to group, talking with them, taking group pictures and selfies. I spent my time like that for 2 hours. I remember they had brought a lot to eat (a huge table filled up, they call it PotLuck over there! ), But unfortunately I could not taste one of the dishes! I remember taking a dish of “Nasi Kampur” (rice cooked with vegetables and meat), I was going to start eating it when one of my students called me. I put my dish on a table, and when I came back I found my dish on the floor … I really did not eat anything! But sharing my last moments with them was much more important! They thanked me for what I did for them; Come to them to teach them English and new things, at least with a different point of view. I really did not expect to have as much “impact” in my community (because at the beginning I did not teach them the lessons – apart from the children – but I was assisting Ana, the CDO). After the evening, I talked about my feelings with Ana, she told me that I had this kind of presence in the classroom, which she could not explain, but you could tell the difference when I was there and when I was not! It’s hard to explain, but I was surprised that people do it for me and appreciate me (not that I am associable, but in some places it often goes in one direction, and we do not So much back!) My biggest challenge, I think, was to be away from my family for 8months. But also to be accepted in my community and by the people with whom I worked. Before I left for Malaysia I was shy; When I arrived in a new team at work, or in a new group of friends, it was “difficult” for me to be sociable. I mean that I was more a listener than a person who speaks from the first meetings. Now I can be “proud of myself” because I can speak without embarrassment, ask questions, and be “curious” from the start. Since I came back, I have kept all my memories, everything I learned there in my communities (good for only a month and a half! ), And most of all I am very happy and grateful to With regard to my sending organization who gave me this opportunity and believed in my abilities! I learned to know another company for 8 months, their lifestyle, but also to know me. How I can overcome various situations that arise every day, week, month! Now I know that I can adapt easily in any situation, and that I am very patient! I do not care a little for the worries (being polite!) And I am open-minded and supposed (without giving me flowers! ); I think we should all be a minimum like that, especially nowadays! I realized that developed countries are concerned about things that are not important, and that many people are superficial. When I returned, I did not feel well for a while; The time to come back to reality (more with all that is happening in France and in the world …) I felt bad, I could not understand how people can’t accept themselves, More open-minded, being at peace with themselves and with others … Unfortunately, I could not change the world, but I know that I can give some positivity and joy to others, and it is this Which makes me happy! That’s why I want to continue traveling, and see all the facets of this World! After the evening, I talked about my feelings with Ana, she told me that I had this kind of presence in the classroom, which she could not explain, but you could tell the difference when I was there and when I was not! It’s hard to explain, but I was surprised that people do it for me and appreciate me (not that I am associable, but in some places it often goes in one direction, and we do not So much back!) My biggest challenge, I think, was to be away from my family for 8months. But also to be accepted in my community and by the people with whom I worked. Before I left for Malaysia I was shy; When I arrived in a new team at work, or in a new group of friends, it was “difficult” for me to be sociable. I mean that I was more a listener than a person who speaks from the first meetings. Now I can be “proud of myself” because I can speak without embarrassment, ask questions, and be “curious” from the start. Since I came back, I have kept all my memories, everything I learned there in my communities (good for only a month and a half! ), And most of all I am very happy and grateful to With regard to my sending organization who gave me this opportunity and believed in my abilities! I learned to know another company for 8 months, their lifestyle, but also to know me. How I can overcome various situations that arise every day, week, month! Now I know that I can adapt easily in any situation, and that I am very patient! I do not care a little for the worries (being polite!) And I am open-minded and supposed (without giving me flowers! ); I think we should all be a minimum like that, especially nowadays! I realized that developed countries are concerned about things that are not important, and that many people are superficial. When I returned, I did not feel well for a while; The time to come back to reality (more with all that is happening in France and in the world …) I felt bad, I could not understand how people can’t accept themselves, More open-minded, being at peace with themselves and with others … Unfortunately, I could not change the world, but I know that I can give some positivity and joy to others, and it is this Which makes me happy! That’s why I want to continue traveling, and see all the facets of this World! I almost stopped this project, my father died 2 months before I left, but I thought that if I stopped every problem, whether small or big, we will never move in our life. I followed what my father said “Do what you want, follow your dreams! At the very beginning, I was a little anxious; being alone in a new culture, a new continent, without friends, family or “support”. Speak in another language that is not my mother tongue. I had no expectations before going to Malaysia and do my EVS. I went there, eyes closed, and I wanted to see what was going to happen. I just wanted to be accepted and do my best, be involved as best I could and give something to the community I was working for. To be honest also, when I did some research on the NGO SOLS 24/7, I was expecting something more “typical” then to work for an underserved community. I worked for 5 months in Putrajaya, Malaysian administrative capital. But the experience was really interesting. I also spent 3 months in Kuantan, a less wealthy and more conservative city on the Muslim religion. But Malaysia is a country with mixed communities; Indian, Chinese and Malay live together, this gives an interesting and extraordinary melting pot. When I arrived there, my plan were first of all to improve my English, work with children and discover the Malaysian life style. After becoming closer to my community, I began to see and understand what were the “problems”, or what I could “change”, or just to give my “European point of view.” For example, I did a “Recycling Championship” for 2 weeks with the children, in order to teach them how and why it is important to recycle; Because often when I went to go hiking, whether it was in the jungle, public parks or beaches, you can see detritus everywhere www.svice.co.uk www.lesjardiniersdelamobilite.fr. It was a shame, they do not see the importance of preserving the environment. With adults we have debated, so that they improve to speak to an audience, and with the teenagers we have done many workshops for their future; Professional and personal (about the language of the body, we made the stories of the week to allow them to be more creative, talk about new technologies …) In terms of personal accomplishment, I learned that I could easily adapt to another culture, to another continent, outside of my “comfort zone”. That was the biggest challenge for me. Now I can say that I am more confident, I believe more in my skills and in myself. Before changing my center I had a farewell evening and almost all of my students came and told me how important I was and how I “changed” something in their life; For me it was one of my best memories. (Because I do not tell you all what I had between drawings, words, cups, jewels …), a wonderful compliment that one can do! It’s important to know what people think of ourselves, to have opinions. Because without that, we do not know what we can change, or improve. I also learned to keep it simple, because I think that in developed countries too often we concentrate on small things, which in the end are not so important. In terms of professional accomplishments, I learned to speak English (because in France one learns English, grammatical rules, but one does not practice it enough!). 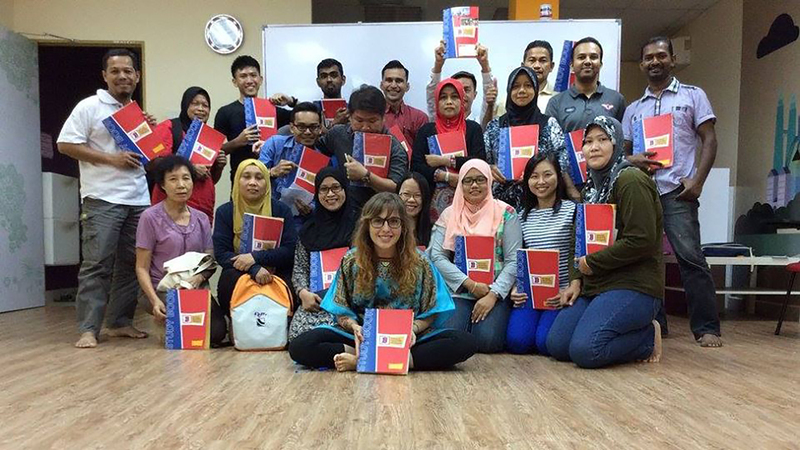 I also gave lessons in English (children, teens and adults) that spoke another language, the Bahasa Melayu. I took care of the administrative part of a center. Send reports or requests on time, sometimes with a short delay. How to face the challenges that the community can give us; Students or anyone who is late, or who do not come at all, shift appointments 10 minutes before … How to recruit, contact a local NGO. I also organized, at least once a month, an event for and with the community. If I had to share with you one of my best memories, it would be at my farewell party, before leaving Putrajaya after 5 months, and going to Kuantan for 3 months. Almost all of my students have come (as have the new ones that started two weeks ago with us). We started the evening at 8 pm and from that moment I spent my time only with my students, calling from group to group, talking with them, taking group pictures and selfies. I spent my time like that for 2 hours. I remember they had brought a lot to eat (a huge table filled up, they call it PotLuck over there! ), But unfortunately I could not taste one of the dishes! I remember taking a dish of “Nasi Kampur” (rice cooked with vegetables and meat), I was going to start eating it when one of my students called me. I put my dish on a table, and when I came back I found my dish on the floor … I really did not eat anything! But sharing my last moments with them was much more important! They thanked me for what I did for them; Come to them to teach them English and new things, at least with a different point of view. I really did not expect to have as much “impact” in my community (because at the beginning I did not teach them the lessons – apart from the children – but I was assisting Ana, the CDO). After the evening, I talked about my feelings with Ana, she told me that I had this kind of presence in the classroom, which she could not explain, but you could tell the difference when I was there and when I was not! It’s hard to explain, but I was surprised that people do it for me and appreciate me (not that I am associable, but in some places it often goes in one direction, and we do not So much back!) My biggest challenge, I think, was to be away from my family for 8months. But also to be accepted in my community and by the people with whom I worked. Before I left for Malaysia I was shy; When I arrived in a new team at work, or in a new group of friends, it was “difficult” for me to be sociable. I mean that I was more a listener than a person who speaks from the first meetings. Now I can be “proud of myself” because I can speak without embarrassment, ask questions, and be “curious” from the start. Since I came back, I have kept all my memories, everything I learned there in my communities (good for only a month and a half! ), And most of all I am very happy and grateful to With regard to my sending organization who gave me this opportunity and believed in my abilities! I learned to know another company for 8 months, their lifestyle, but also to know me. How I can overcome various situations that arise every day, week, month! Now I know that I can adapt easily in any situation, and that I am very patient! I do not care a little for the worries (being polite!) And I am open-minded and supposed (without giving me flowers! ); I think we should all be a minimum like that, especially nowadays! I realized that developed countries are concerned about things that are not important, and that many people are superficial. When I returned, I did not feel well for a while; The time to come back to reality (more with all that is happening in France and in the world …) I felt bad, I could not understand how people can’t accept themselves, More open-minded, being at peace with themselves and with others … Unfortunately, I could not change the world, but I know that I can give some positivity and joy to others, and it is this Which makes me happy! That’s why I want to continue traveling, and see all the facets of this World! If I had to give advice to young people who want to do a European Voluntary Service, I just have to say “Go ahead! “. “Go ahead, listen to your heart and do what you want to do!” Because no one will do it for you. We only have one life and we should follow our desires and realize our dreams! It is a chance to know and discover new cultures and what is happening elsewhere than at the bottom of our door. We must be open-minded today. And through this kind of experience, we learn a lot about ourselves, and we change a lot; we evolve in a different way. For nothing in the world I would like to exchange what I experienced and I hope that I could relive an experience like that. I was a teacher for 8 months, but my students taught me more than I did for them! I’m only 22 years old, and my life takes a new turn.